I find myself daydreaming about my future home a lot. Where will it be? How many rooms will it have? What kind of floorplan do I want? Will I still be in Chicago? But more importantly, what will it look like?! I go through phases of loving different styles as my own style evolves, but one thing I have always always loved, is a white kitchen. I love how crisp, bright and inviting they are, and can imagine myself with my friends and family drinking wine and nibbling on snacks served on my glistening white marble countertops. The good life! 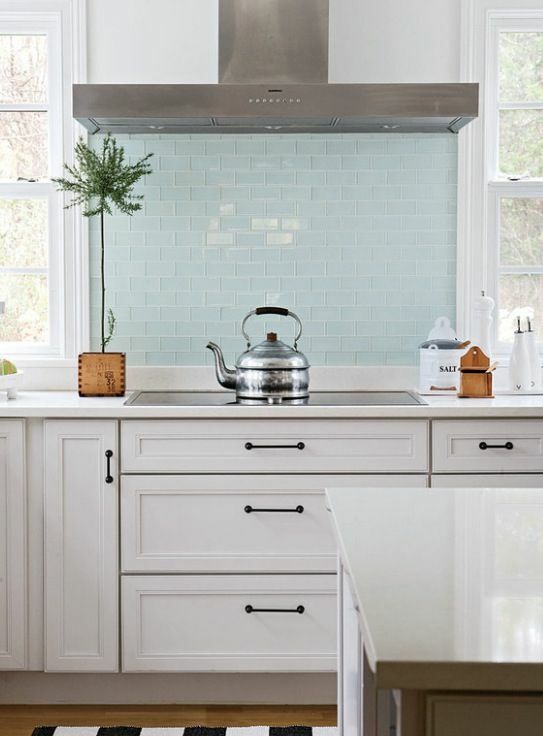 The one design element in the white kitchen that I’m not so sure about is the tile on the backsplash. As much as I love all white, I do love a good pop of color. So will it be white or color? Small tiles or large? Should we throw a cool pattern in there? Herringbone? Subway tiles? Decisions, decisions! Then I remember that I don’t have to pick now, this house does not exist yet. But still, it’s a fun thing to think about. Which route would you go? Crisp and white or bright and colorful?